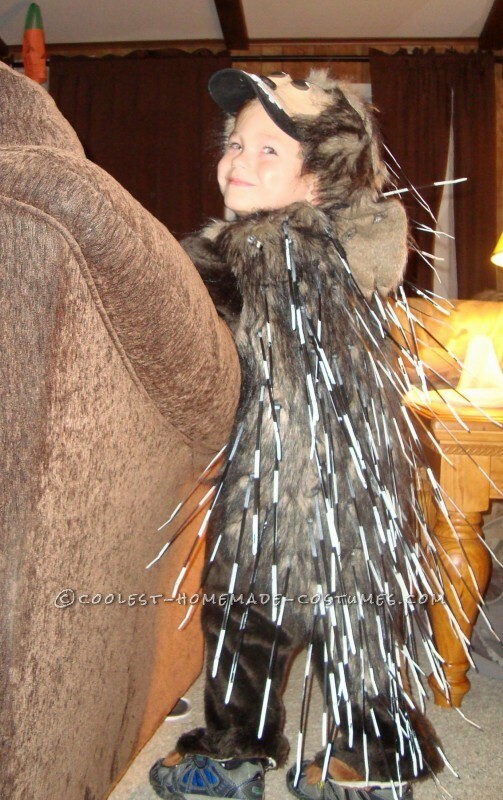 “I want to be a Prickly Porcupine Mom!” was my four year old’s response when I asked him what he wanted to be for Halloween this year. I have to hand it to him it’s a unique choice. This request gave me a lot to ponder late at night while awake from insomnia. I raided my husband’s shop to gather supplies, black plastic zip ties, spray paint, glue, ping pong balls …. hmm I still need more supplies. 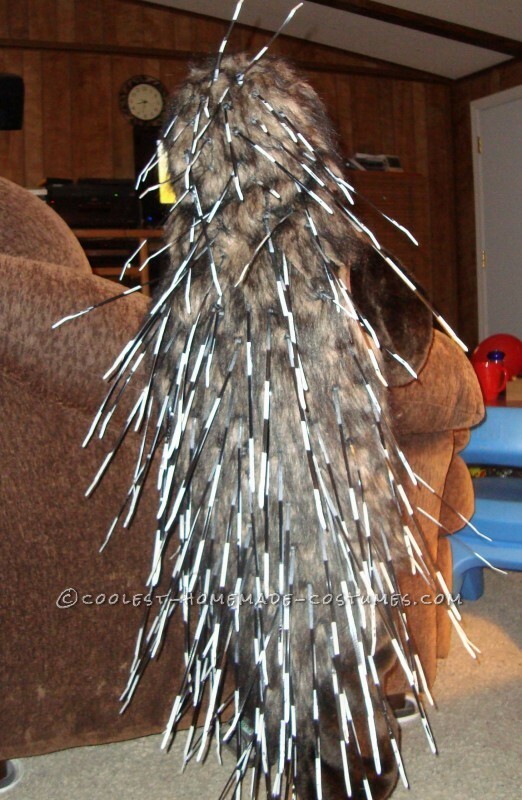 The next day it was off to the thrift store where I found a girl scout brownie vest, perfect for my porcupine base. I also found a brown furry body suit that I think may have been a monkey in it’s previous life. I performed a tailextomy on the monkey suit. I headed to the fabric store to purchase some faux fur which I cut into the back shape of the vest and extended it down to knee level. I cut slits in the fur and after painting the zip ties, threaded them through the slits and secured them. I then glued the fur piece to the back and around the sides of the vest. I installed a Velcro closure to the front of the vest. 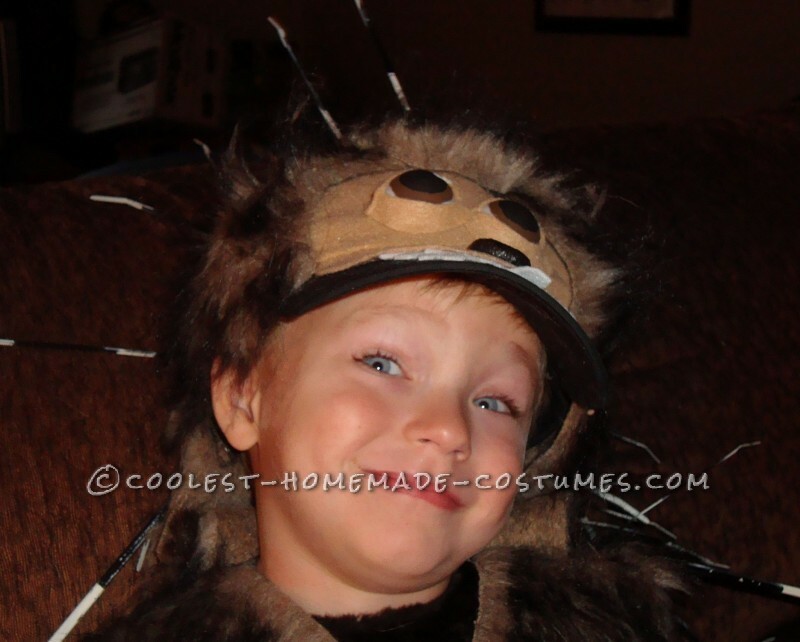 I found a black baseball hat that I fashioned eyeballs out of the pingpong balls and attached more fur with glue to the hat, I used an acorn top painted black for the nose. My little guy loves this costume and is having a ball this Halloween. With quills like these I don’t think anyone will try to steal his candy (except maybe me after he goes to bed of course). Hey, that’s a small price to pay for a costume this cool!